In an absolutely unbelievable incident, a stray dog in Oman found and rescued a newborn baby and carried him through the desert till it was rescued. Authorities in Oman are opening investigations after a really unbelievable incident that happened in the country and surprised the nation, the story quickly went viral throughout the Arab world as people shared it on social media. The story took place in Kharbika, Oman. As a man was riding his bike on the morning of Last Saturday, the man noticed a stray dog walking on the road with something in his mouth. He noticed blood drops on the road and went closer to the dog to take a closer look, and when he did, he couldn’t believe what he was seeing. 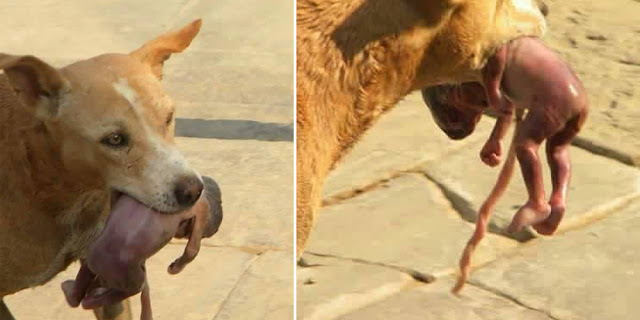 The dog was holding a NEWBORN in his mouth, the boy must have been only a couple of hours old!! 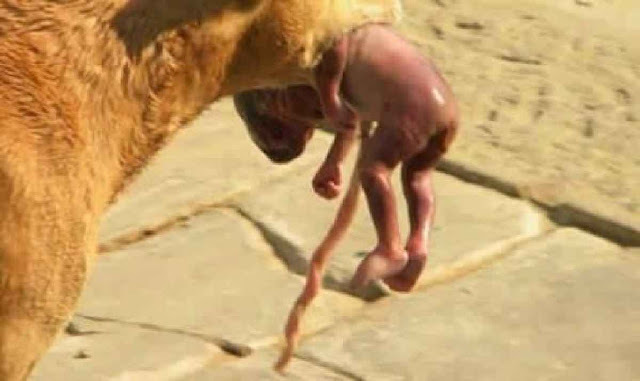 The baby even had his umbilical cord still attached!! The man ran towards the dog in an attempt to save the child, he thought the dog was going to eat the child, if this was true, the dog would’ve put up a fight for him. As people gathered around the scene, the dog didn’t do anything to prevent them taking the child from him, it was if he was delivering him to them. People were a bit surprised at the dog’s reaction, but this is what you would expect from dogs, stray dogs or pets, dogs are good animals by nature. As it happened, the dog was wandering near a hospital ( maybe he was trying to find it? ), and so the child was transferred to the emergency room quickly and there, the doctors couldn’t believe their eyes, the child was not hurt, even though the dog must have been holding him like that for god knows how long. Miraculously, the child is absolutely fine! The authorities in Oman have opened an investigation and is trying to figure out what happened. The police had checked all the hospitals’ records as they suspected the dog could’ve grabbed the baby from there, but all the mothers had their babies and no one was missing. However, witnesses in the hospitals have told the police that a girl came earlier to the emergency room but refused to let the doctor check her if he was going to record it, and she fled the hospital. The police fear that this girl might be the mother of the child, and that she gave birth to the child and threw him somewhere where people couldn’t find him, but this dog did, and somehow he knew where to head to save this baby! Isn’t this just absolutely Incredible!! Even in the remote parts of the world, the cruelty of the deserts, dogs can prove they are angels that fell from the sky. Yes, what happened to the dog? Should get an award of some kind. Food for life. Something. Good dog. Please try and find it and a home for both the baby and the dog. I would take both the baby and the dog.